Kyocera has added to its TASKAlfa range of black and white multi-function devices with three new models and a number of new features aimed at offices with 10 to 30 users. The TASKAlfa 3501i, 4501i and 5501i all print A3 paper at 35 to 55 pages per minute, and integrate with Kyocera's HyPAS (Hybrid Platform for Advanced Solutions) software to help customise them for different environments. 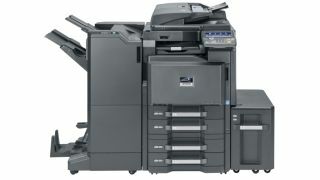 They have colour touch panels to access all print, scan, copy and fax functions. An embedded optical character recognition scan options makes it possible to convert from scans to searchable PDF documents. Installation time is said to be five minutes and Kyocera said the models can reduce total electricity consumption by half. The release follows the launch of an A4 model in the TASKAlfa range, the 265ci, in May.